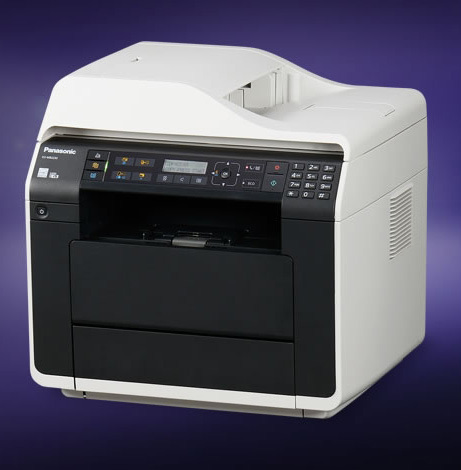 The KX-MB2575 multi-function printer is designed for high-productivity with 30 ppm business power. With multi-size paper handling through a multi-purpose tray which can hold up to 50 sheets of various sizes, high-speed simplex and duplex printing and a large 500-sheet paper cassette, the KX-MB2575 features a remarkably compact cubic design and allows a high-power multifunction printer to be installed on even small desks. The KX-MB2575 also comes with built-in wireless networking, compliant with the world standard IEEE 802.11b/g/n, enabling a wireless connection to a network PC via your local network, without requiring a physical LAN connection. Printing on one side of a page can be wasteful and inefficient. That’s why the KX-MB2575 features duplex printing capability. Conventional A4 size multi-function printers invert the pages one at a time, resulting in slow performance and poor productivity, the KX-MB2575 comes as standard with quick duplexing, making it possible to print both sides at virtually the same speed* as single-side printing. *For all printers in the KX-MB2500 series, duplexing productivity is 93%. The KX-MB2575 is equipped with a 50-sheet automatic document feeder capable of handling the smaller A5 and A6 formats as well as A4. This capability is especially useful in doctors’ offices and pharmacies where smaller documents are commonly used. It can also print onto the smaller A5 and A6 sizes. Usually compact MFPs designed to be used in small offices or home offices (SOHO) are equipped with a 250-sheet paper cassette, while commercial printing paper is normally supplied in 500-sheet packs. Despite its compact design and slim profile, the KX-MB2575 is equipped with large-capacity cassettes capable of holding a full pack of 500 sheets. So you can load all 500 sheets at once, and not have to leave open reams of paper lying around your office.